November’s OotS is Ink Wash, along with their Tattered Wraps and Silent Scarf! This month’s coat and items were created by Meru. You may purchase this set in the Out of the Shadows shop through the end of the month! October’s Creative Collective has drawn to a close! Thank you to everyone who posted a submission, engaged in a roleplay, or offered some feedback this past month. The raffle has been drawn and a new prompt has been posted! Additionally, the Canvas Circle is back from its brief October hiatus! We hope that everyone who participated enjoyed the Inktober challenge! The My Corner of the Cave forum activity has concluded! The raffle has been drawn, and the new background and avatar backgrounds inspired by the winners will make their debut in the next few weeks, so keep an eye out! As if drawn forth by the Halloween spirit itself, Howard has once again opened his Moonlight Collection for business. He’s got a few new treats to trade you for your hard-earned nuggets, but his supplies are limited! He plans to close up shop and wing away at the end of the day on November 7th, so be sure to stop by before then! Letting these deals pass you by would be horror-ble! 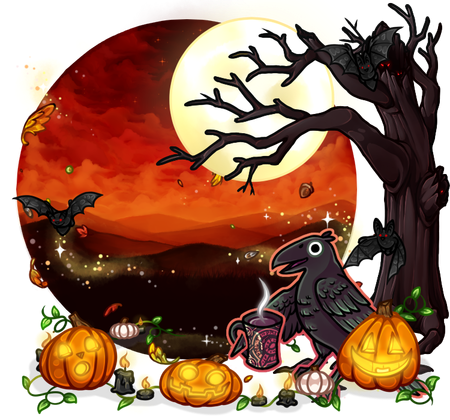 The Sorcery Spelltacular event is ongoing through November 11th! Bruc and Jessamyn have invited you along on their yearly work retreat to help them harness the natural magic of their hideaway by creating power words to etch into the cavern walls. And while you’re busy fishing for runestones, they’ve each invited you to help with their respective magic experiments! You can find more details about the event and its concurrent forum activities in this thread! We’d One of us would love your help! The other one would certainly tolerate it! Mycena Cave now has a Notifications vault — you can find it in the menu at the very top-right, just below “Community settings” and “Account settings”. This feature allows you to protect notifications that you cherish and want to keep safe. Pinging Jacq because we talked about this in another thread. Hoooray! Thank you so much! Being able to stash my special notifications during events, then restoring them afterwords, is completely perfect! I wholeheartedly approve of the Notifications Vault. Thanks glitch! Sparking Stars, Craggy Mountains, Ringed Wanderer, and City on the Water! Sparking Stars was designed by KaceyCat, Craggy Mountains by firewyrm2018, and Mists of Fate by Kiwi as a part of winning the raffles of the My Corner of the Cave event! Thanks, you three!! Oh my goodness I’m so excited, I’ve already made Starla up to match the avvie background~! yessssss! I love the mountains so much! Thank you myla! Those are lovely, and thank you so much for the Notification vault! glitch Sadly, that came a little too late and I lost my notification of receiving 750k nuggets from ‘A mysterious stranger’. Nice to know it’s possible to save them now though! edit: OMGGG a hUge thank you to the mysterious admirer who gifted the bgs! The Health Potion equippable has a potion bottle and an aura that are individually toggleable. Bags of Wonders can be won by participating in the Creative Collective!